Instant downloads of all 942 LitChart PDFs (including Small Great Things). Welcome to the LitCharts study guide on Jodi Picoult's Small Great Things. Created by the original team behind SparkNotes, LitCharts are the world's best literature guides. A concise biography of Jodi Picoult plus historical and literary context for Small Great Things. A quick-reference summary: Small Great Things on a single page. In-depth summary and analysis of every chapter of Small Great Things. Visual theme-tracking, too. Explanations, analysis, and visualizations of Small Great Things's themes. Small Great Things's important quotes, sortable by theme, character, or chapter. Description, analysis, and timelines for Small Great Things's characters. Explanations of Small Great Things's symbols, and tracking of where they appear. An interactive data visualization of Small Great Things's plot and themes. Picoult is the oldest of two children. When she was 13, her parents moved the family from Long Island to New Hampshire. Both Picoult's mother and grandmother were teachers, and she credits them with influencing her to become a writer. She received a degree in creative writing from Princeton in 1987 and later earned a master's degree in education from Harvard. In between her degrees she held a number of jobs, including teaching English at the middle school level. Her first novel, Songs of the Humpback Whale, was published in 1992, and she's published nearly one per year since then. Her 2007 novel Nineteen Minutes, which follows the events of a fictional school shooting, was her first novel to make the New York Times Bestseller list. Throughout her career, Picoult has worked with a number of organizations and causes that work to empower and educate young people, as well as literary organizations like Vida: Women in Literary Arts that seek to raise the visibility of marginalized voices in the literary world. She lives in New Hampshire with her husband and three children. 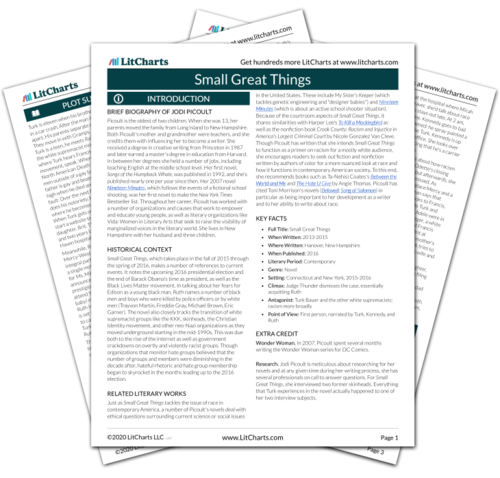 Get the entire Small Great Things LitChart as a printable PDF. Small Great Things, which takes place in the fall of 2015 through the spring of 2016, makes a number of references to current events. It notes the upcoming 2016 presidential election and the end of Barack Obama's time as president, as well as the Black Lives Matter movement. In talking about her fears for Edison as a young black man, Ruth names a number of black men and boys who were killed by police officers or by white men (Trayvon Martin, Freddie Gray, Michael Brown, Eric Garner). The novel also closely tracks the transition of white supremacist groups like the KKK, skinheads, the Christian Identity movement, and other neo-Nazi organizations as they moved underground starting in the mid-1990s. This was due both to the rise of the internet as well as government crackdowns on overtly and violently racist groups. Though organizations that monitor hate groups believed that the number of groups and members were diminishing in the decade after, hateful rhetoric and hate group membership began to skyrocket in the months leading up to the 2016 election. Just as Small Great Things tackles the issue of race in contemporary America, a number of Picoult's novels deal with ethical questions surrounding current science or social issues in the United States. These include My Sister's Keeper (which tackles genetic engineering and "designer babies") and Nineteen Minutes (which is about an active school shooter situation). Because of the courtroom aspects of Small Great Things, it shares similarities with Harper Lee's To Kill a Mockingbird as well as the nonfiction book Crook County: Racism and Injustice in America's Largest Criminal Court by Nicole Gonzalez Van Cleve. Though Picoult has written that she intends Small Great Things to function as a primer on racism for a mostly white audience, she encourages readers to seek out fiction and nonfiction written by authors of color for a more nuanced look at race and how it functions in contemporary American society. To this end, she recommends books such as Ta-Nehisi Coates's Between the World and Me and The Hate U Give by Angie Thomas. Picoult has cited Toni Morrison's novels (Beloved; Song of Solomon) in particular as being important to her development as a writer and to her ability to write about race. Wonder Woman. In 2007, Picoult spent several months writing the Wonder Woman series for DC Comics. Research. Jodi Picoult is meticulous about researching for her novels and at any given time during her writing process, she has several professionals on call to answer questions. For Small Great Things, she interviewed two former skinheads. Everything that Turk experiences in the novel actually happened to one of her two interview subjects. Brock, Zoë. "Small Great Things." LitCharts. LitCharts LLC, 7 Feb 2019. Web. 21 Apr 2019. Brock, Zoë. "Small Great Things." LitCharts LLC, February 7, 2019. Retrieved April 21, 2019. https://www.litcharts.com/lit/small-great-things.